If you use WordPress, you must agree that there are some basics you need to learn. Even if you have somebody doing all the work for you, it is still advisable to know your way around the site. 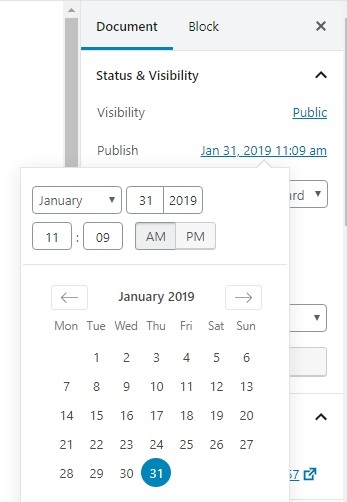 Did you know you could schedule posts in WordPress to be published at a later date? Scheduling posts helps you publish articles at your own ideal time regardless of whether you are busy or not. You can choose when they go live, specific day and time. The option to schedule posts is not visible; therefore, you need to know where to look. Once your blog post is complete, instead of publishing immediately, on the right column of the edit screen, look under the ‘Document’ tab. 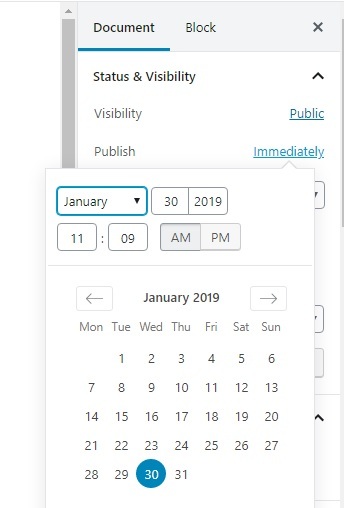 Once you have selected the publish immediately icon, this will show you a date and time picker. You can then choose whatever date and time you want to publish. You can then select your preferred date for your post to go live. There is also a provision of backdating the post using the same tool. Click on the ‘Schedule’ icon and WordPress will automatically schedule your post according to date and time set. The ‘Publish’ button changes immediately to ‘Schedule.’ Click on it so that you can save the changes you have made. Sometimes, just as TechLoris guides you on how to resolve Driver Power State Failure, there are also some recommended ways to ensure that your scheduled posts run smoothly. Remember to change WordPress timezone settings so that you can log on your most preferred timezone to schedule your posts. It is possible to see all your scheduled posts. Log onto your site and go to ‘Posts- All Posts’ and click on the available ‘Scheduled’ link. You will see all scheduled posts in the queue. Sometimes, a misconfiguration in your WordPress hosting server could make cron-system used to run scheduled posts miss the schedule making posts not get published. In the case that this happens, you can install the WP Missed Schedule plugin. It is possible to schedule pages using the same format as the one for blog posts. It is impossible to schedule changes made to a past post that you had previously published. All changes made to the published post or page will always go live once saved. 1. As a blogger, it is crucial to schedule posts, if possible a week’s or two worth. Look at this scenario, you travel to a new country and get allergy, you can’t even work, you are almost bedridden. Your scheduled posts will still go live regardless which makes your posts consistent with no interruption. 2. Publishing on a regular basis helps grow your reader list as they can already tell your posting pattern. You can write as many blog posts as possible and get ahead on your editorial calendar. The advantage here is that you can always schedule each of the posts to your preferred date. 3. There is always a specific time every day your site gets most of the readers. Identify when that is and work with their time zone. It may not be favorable to you which makes scheduling convenient. You can leverage the traffic even when sleeping or going about your other day jobs. 4. What happens when you are going on vacation for a whole month, and it’s a no-work vacation? Scheduling your posts ensures that your readers still enjoy your posts even when you are surfing in Maui. WordPress has exciting features to help you grow your audience, improve your site layout and so on. The truth is, you can’t learn everything in a day. As days progress, you get better and better. You will discover that as you keep learning, you may not even need a developer. With YouTube tutorials, you can also come up with your own site. Scheduling posts should be one of the things you utilize on your WordPress site.